"Europe-wide diplomatic push is under way to persuade the Trump administration to ease US sanctions targeting Russia, amid growing fears that the restrictions are so severe they threaten unleashing another economic recession across the continent"
Something strange happened in the days immediately preceding Trump's airstrikes on Syria: first Germany, then Italy, refused to join the US-led effort, which ultimately also included the UK and France. Commenting on this curious split within the European core, we said that "there are at least two European nations who remember that when it gets cold in the winter, there is one country they call to provide the natural gas they need for heating. Russia"
In a stark reminder that every political action has an unexpected - and usually unpleasant - reaction, Paris, which is in charge of coordinating the anti-sanction effort after business limits on Russian metals companies caused aluminium and nickel prices to soar, "is pushing allies including Berlin, London and Rome to make a joint representation in Washington." As the FT adds, the French-led initiative underscores the widening concern in Europe about the consequences that sanctions could have on key EU industries from cars to aerospace. Echoing what we said almost two weeks ago when commenting on the Rusal sanctions, a French official warned that the sanctions, which have crippled Russian aluminium producer Rusal, would have a “direct and major impact on the provisioning of key products” and that a number of industrial plants in Europe were threatened with closure. The push for a US truce with Russia - which is taking place under the administration which ironically has been alleged to have colluded with Putin to win the election - comes ahead of separate visits to Washington next week by the two leaders of Europe, German chancellor Angela Merkel and French President Emmanuel Macron. They will meet President Trump as part of broader diplomatic efforts to soothe transatlantic relations, already strained by tension over planned US tariffs on steel and aluminium. One reason why Europe is especially concerned is that under the provisions of the new penalties — contained in the Countering America’s Adversaries Through Sanctions Act — Europeans are effectively barred from doing business with targeted Russian companies and their oligarch owners. This has led to a collapse in the stock and bond prices of Rusal, the world's largest aluminum producer outside of China, as the company finds itself locked out of capital markets and unable to roll its maturing debt or fund further expansion. Meanwhile, amid fears of an imminent Rusal bankruptcy and chocked supply lines, aluminum prices have soared as much as 30% in the past two weeks, resulting in fears of an imminent surge in downstream prices, as well as a broader inflationary spike. It's not just aluminum. As the FT adds, German business leaders appear to also have had enough of Trump defining global Russian trade relations, and have raised concerns with government officials, with a gathering held Thursday at the Berlin offices of the German committee on eastern European Economic Relations, an influential lobby group. “This affects the whole production chain, all the way to car producers and the aerospace industry,”said one person briefed on the concerns raised at the talks. 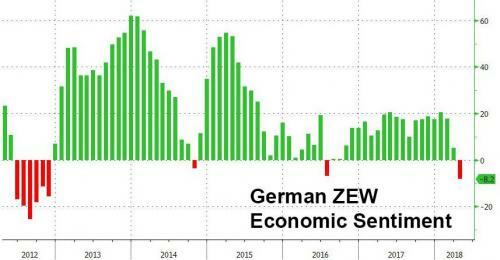 Clearly, Germany is worried that the longer Russia is forcibly excluded from supply chains, the more adverse the consequences will be, as the recent plunge - the biggest since 2012 - in Germany's ZEW Economic Sentiment index showed. Meanwhile, Merkel’s spokesman said the German government, “at all working levels”, will “point out where the interests of German companies have been affected and make it clear where there are concerns and where we see undesirable consequences." Needless to say, it would be delightfully ironic if Trump's relationship with Europe deteriorates further because the US president - who is effectively a Russian operative according to the Democratic lawsuit filed on Friday - refuses to concede on European demands to ease back on Russian sanctions, in the process plunging Europe into a recession.